Accurate Estimates! We carefully diagnose the sewer problem present alternative sewer repair options and prices that we stick to. Real Experience with NJ Sewer Repair! We use the most up to date equipment and methods backed by years of experience. No-Hassle Sewer Repair! Dealing with a broken pipe can be stressful. When you hire our repair, replacement and installation experts your broken sewer pipe, drain or main waterline..will be located quickly and your job will be completed quickly with minimal hassle, very often we can be done in just one day. Sewer systems are an indispensable part of modern life. Since the 19th century, the sewer system has been a huge necessity, removing waste materials safely from our homes and urban areas. Most homeowners don’t know a whole lot about sewer lines, but sewer problems requiring sewer repair services are surprisingly common. Millions of homeowners each year experience problems that require sewer service in NJ but don’t realize there’s a problem until something really serious happens as a result: collapsed sewer pipes, serious sewage backup through toilets and drains, and other emergencies. When it comes to sewer repair service, it’s best to deal with the problem sooner rather than later. 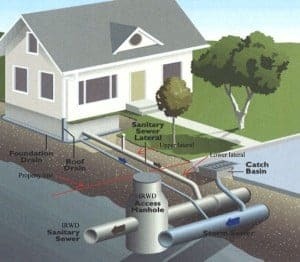 Here are six important questions that New Jersey homeowners need to ask themselves about their residential sewer pipe systems. 1. How old are your pipes? An alarming number of sewer pipes in the United States are woefully outdated. According to the EPA, the average age of a collapsed main sewer line in the US is 47 years. Sewer pipes are easy to take for granted, so many New Jersey homeowners don’t think about how old their pipes might be. 2. Are there trees growing near your sewer lines? Tree roots are notorious for ruining sewer and drain pipes. 3. Does your property have clay soil? Sewer lines in clay soil are more prone to corrosion. 4. Do you have perpetually clogged toilets and sewer or drains? This is a classic warning sign of a sewer pipe problem. 5. What are your pipes made of? Modern sewer pipes are usually made of durable, high-grade plastics. However, many older pipes are made from clay or steel, which develop problems like corrosion and channeling that aren’t seen as often in contemporary sewer lines. 2015-10-22 Emergency Septic Tank Problems? Septic Tank Srervice NJ Plumber on Call 24 Hours. 2015-09-28 Should You Replace Your Old Metal Drain Pipes? 2015-09-25 When Do You Need Emergency Drain Cleaning? 2015-10-13 Is Grease Trap Installation a Legal Requirement for Your Business? 2018-04-03 Why can’t an ordinary NJ plumbers handle sewer problems for you? 2017-06-12 There Are Some Emergency Plumbing Sewer Problems That We Cannot Solve So Easily! 2015-06-01 Should You Call a Professional to Unclog Your Sewer Pipe? 2013-12-05 I Have to Work on Getting my Kids to be The Clogged Toilet Next Halloween! 2015-08-09 Ho-Ho-Kus - Are Tree Roots Damaging Your Sewer Main? 2016-12-03 Sewer Camera Inspection: Do I Need It? 2018-04-13 Sewer Repair Job in NJ? Let the Right Contractor to Do it in Right in the first Time. 2015-01-14 Sewer Line Repair With Sewer Video Camera Inspection. 2016-04-06 Plumber: Why Is My Sewer Line or Drain Pipe Clogged Every Week? 2016-02-26 Question for NJ Plumber: How Does The Home Sewer System Work? 2015-10-13 How The Sewer Water Piping System Works? 2014-01-23 Sewer System and Plumbing Pipe Repair in Basement Valve Inspection by Plumber For Homes. 2014-01-21 Ten Dollar Miracle Plumbing Fixture For Your Drain Can Save You Thousands of Dollars And Prevent Sewage Back Up. 2014-01-19 Tutorial On How to Unclog Your Garbage Disposal And Get it Running Yourself. 2014-01-19 Step-by-Step Instructions on How to Use a Mini Rooter for washtub, floor drains roof vents and medium-sized drains. 2014-01-18 How to Clean The Inside of Your Bath Drain with A Long Brush And Enzymes..
2014-01-16 Sewer Main Camera Inspection Reveals Sewer Cracks, Bad Piping And Sewer Obstructions. 2014-01-14 Trench-less Sewers, Re-Piping and Drain Cleaning And Plumbing Services With Honesty. 2014-01-05 Why Your Basement Toilet smells Even if its Not Clogged ? Sewer pipe problems are surprisingly common. Although sewer clogs can be prevented with measures like not flushing paper towels or washing kitchen grease down the sink, some problems are harder to control. Many homeowners have old, outdated sewer pipes which have rusted and corroded over time. Soil erosion can also cause damage to your sewer main line, as can tree roots that grow around and into the pipes. How can you tell if you’re going to need sewer repair service soon? Here are X red flags that New Jersey homeowners can look out for. If you notice these problems in your home, you should probably call a sewer repair company. 1. Sewage smells. This is sometimes an obvious sign that something’s wrong with your sewer line. Although a foul smell from one drain or fixture could mean a clog in your plumbing, if it’s widespread throughout your home, your sewer is probably clogged. 2. Drains gurgle when you run the sink or flush the toilet. It’s not a good sign if using one drain affects another one. If this is happening throughout your kitchen and bathrooms, you might have a clog down in the sewer main line. 3. Standing water or leakage in your sewer cleanout. The sewer cleanout is a white or black pipe with a special threaded cap, usually found somewhere along the periphery of your house. If you unscrew the cap to find water inside it, or flowing out of it, you’ll probably need sewer cleaning or sewer repairs. If you’re having any of these problems in your home, call drain contractors NJ today at A1 Sewer and Drain for 24 hour drain sewer repair services in New Jersey, at 201-645-0888.